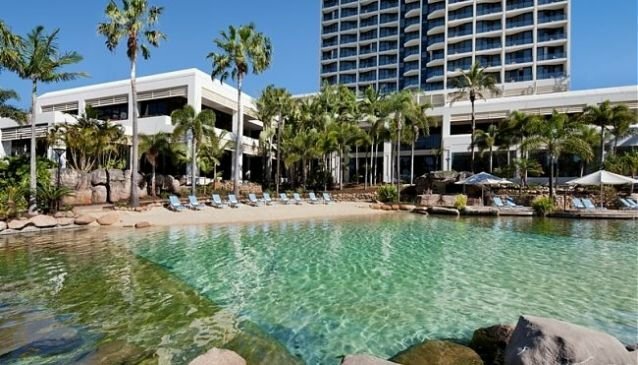 Surfers Paradise Marriot Resort & Spa offers a number of resort amenities and services for business travelers, families and other vacationers. Guests are welcomed into a large, luxurious lobby featuring a curving staircase. Enjoy & live like a king. The hotel has 300 guestrooms and 30 suites. All of the guestrooms and suites have air-conditioning, operable windows, private balconies, mini-bars, and marble bathrooms with a separate bath and shower. High speed internet access and safes are available in all of the rooms. Guestrooms are available with one king or two double beds, with a view of the ocean or the mountains. These guestrooms have writing desks. Accessible guestrooms are available with a roll-in shower or a bathtub seat. Elandra Retreat Club Level rooms are available with one king or two double beds (and evening turndown service), with views of the hinterland or the ocean. These rooms offer Club lounge access to guests, with complimentary continental breakfast, snacks, afternoon tea, hors d'oeuvres, dessert, and non-alcoholic drinks. These rooms are non-smoking, and some are available with connections to other guestrooms. Junior suites have a separate living/sitting area, and views of the pool and the ocean. These suites have one king or two double beds. Guests can relax in the two-person whirlpool tub. One-bedroom Executive Suites also come with one king or two double beds, and a view of the ocean. These suites have a separate dining and living rooms, and a two-person whirlpool bath. Elandra Retreat Junior Suites and Executive Suites are also available, with club lounge benefits. A large one-bedroom ocean-view king suite has its own dining room and living room, as well as a two-person whirlpool bath. For the ultimate luxury, stay in the Presidential Suite, which has a master bedroom with a king-sized bed and a large en-suite master bath with a two-person whirlpool bath. There is also a second bathroom. The Misono Japanese Steakhouse at the hotel offers both dinner and entertainment. You can marvel at the chefs' spectacular knife skills as they prepare your teppanyaki dinner in front of your eyes. The hotel's Lagoon Restaurant serves a buffet and a la carte menu for breakfast, lunch and dinner. This contemporary restaurant has an international menu to please any palate. Relax with views of the hotel's saltwater lagoon and enjoy tapas (small Spanish-inspired appetizers and snacks) at the Lobby Lounge. The pool bar is open for lunch and dinner, for a more casual meal. The hotel offers 24-hour room service. There is an outdoor heated swimming pool. Guests can book appointments at the Lattouf Hair Spa, which also offers massages and other beauty treatments. A gym and sauna/steam room is available; an additional charge may apply. The hotel offers babysitting services and a children's club, for an additional charge. There is a laundry on-site, as well as a valet service. The hotel staff can exchange currency, and provide assistance with tickets to local attractions. There is also a beauty shop, and a game room. Shops include a florist and a gift shop, which also carries newspapers and other publications. Business services include secretarial and translation services (charges may apply) in addition to the usual copy/fax/printing. There are eight meeting rooms, in a variety of sizes. There is free parking on site, or you can valet park for an additional fee.